At times I think that keeping up with the developments on climate change is better than reading a John Grisham mystery novel. The multiple plots, surprises, hope, despair, conspiracy, and suspenseful endings can, at times, keep me up well into the wee hours of the morning. This addiction has proven to me that the issues are intertwined and complicated, making precise predictions difficult, while giving plenty of fodder for climate deniers to twist around. Given all of this, it is of little wonder that people who do not make climate science their career, can get mixed signals on the level of impact our greenhouse gasses have on the planet. It is time to put an end to this. To simplify the complex. To forget, for a moment, the intertwined historical data and predictions. To focus on the basics. To get rid of the “if” on “if” climate change is occurring and “if” we are responsible for it. Let us pretend that you have a pan of water simmering on the stove. With the burner at a constant temperature, the water will reach a constant temperature as well. If you turn the burner up a bit, after a while, the water will have increased in temperature. Simple right? In a similar fashion, our planet is nearly exclusively heated by the Sun. Over the last few hundred years the energy that has reached the top of the Earth’s atmosphere has been very constant (within 0.1%). Through the greenhouse gases that we have put in the atmosphere, we have done the equivalent of turning up the energy of our Sun by over a half of a percent. To put this in perspective, in 200 years we have done what would normally take the Sun about 50 million years to do (1). Just like the water in the pan, our planet has no choice but to react to this. Due to the complex nature of the Earth’s energy balance, it will take a bit of time, measured in decades, and everything will not go in a straight line, but changes will occur. It really is that simple. We have effectively made our Sun hotter and this has changed, and will continue to, change, the delicate environment that all living beings rely on. Knowing this, we can change the “if” climate change is happening and “belief” in climate change to – we know that there will be changes, and we are the source of these changes. Firm in knowledge, we can act instead of waiting for further confirmation. Have discussions with our friends and neighbors to increase awareness. We can push our leaders for stiffer regulations on reducing emissions, increasing subsidizes on alternatives, and setting a price on carbon. Finally, we ourselves can take steps to reduce our own carbon footprints. We make hundreds of decisions each day that impact our carbon footprint. If you are looking for ways, my latest book, “Feasible Planet” (check it out here) is packed with suggestions. Now some of you may be saying that there is no way that we have effectively increased the Sun’s impact on our plant by over half of a percent. After all, the Sun is huge, how could we possibly have such a large impact? Well, it is true and below are the high-level calculations that have been used in determining this number. 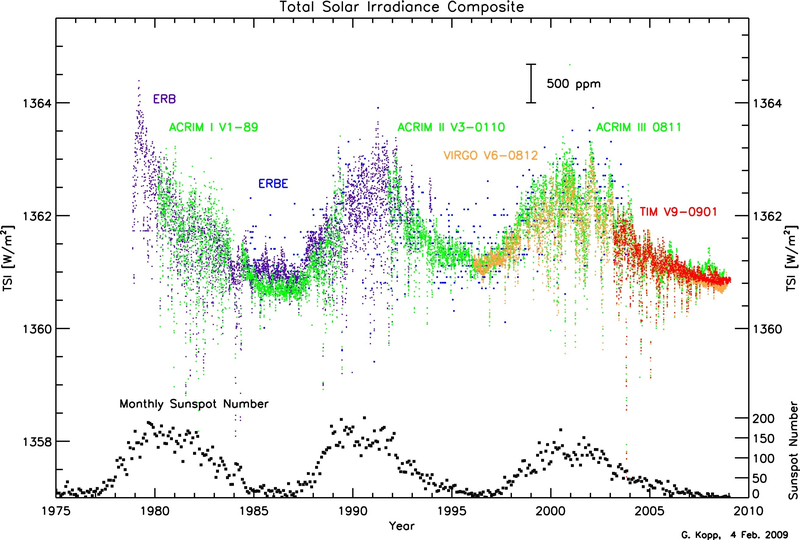 Through satellite measurement over the last 30+ years, we see that the energy emitted from our Sun is about 1360 (+/- 1.5) watts per square meter (2). Because the Earth is a sphere with only one side exposed to the Sun at any time, to get the average across the entire planet, we need to reduce this number by about ¼ (3). This means that across the entire planet, on average, the Sun’s energy that reaches our upper atmosphere is about 340 watts per square meter. The planet reflects a fair bit of this energy back into space, but one of the nasty characteristics of greenhouse gases is that they take some of this reflected energy and send it back to the planet. Through theoretical calculations, measured laboratory results, and actual measurements, the greenhouse gases that we have put in the atmosphere currently reflect about 2 watts per square meter (4)(5)(6) back to our planet or about 0.59% of the total energy that we receive from our Sun. This number is forecast to increase to about 3 watts by the year 2100 or about 0.89% of the solar energy we receive. This energy is above and beyond what would naturally happen if humans were not on the planet. The rate of increase of this additional energy is, as far as I can tell, unprecedented in our planet’s history. After there is acceptance that we have a substantial impact, then we can have a meaningful discussion on the fascinating topic of how the planet will react. Previous: Something to BRAG about !